Citation Information: JCI Insight. 2017;2(14):e94382. https://doi.org/10.1172/jci.insight.94382. Pediatric dilated cardiomyopathy (DCM) is the most common indication for heart transplantation in children. Despite similar genetic etiologies, medications routinely used in adult heart failure patients do not improve outcomes in the pediatric population. The mechanistic basis for these observations is unknown. We hypothesized that pediatric and adult DCM comprise distinct pathological entities, in that children do not undergo adverse remodeling, the target of adult heart failure therapies. To test this hypothesis, we examined LV specimens obtained from pediatric and adult donor controls and DCM patients. Consistent with the established pathophysiology of adult heart failure, adults with DCM displayed marked cardiomyocyte hypertrophy and myocardial fibrosis compared with donor controls. In contrast, pediatric DCM specimens demonstrated minimal cardiomyocyte hypertrophy and myocardial fibrosis compared with both age-matched controls and adults with DCM. Strikingly, RNA sequencing uncovered divergent gene expression profiles in pediatric and adult patients, including enrichment of transcripts associated with adverse remodeling and innate immune activation in adult DCM specimens. Collectively, these findings reveal that pediatric and adult DCM represent distinct pathological entities, provide a mechanistic basis to explain why children fail to respond to adult heart failure therapies, and suggest the need to develop new approaches for pediatric DCM. Absence of cardiomyocyte hypertrophy in pediatric DCM. (A) Wheat germ agglutinin (WGA) staining (red) demonstrating that pediatric donor controls and pediatric DCM specimens display similar cardiomyocyte cross-sectional area. 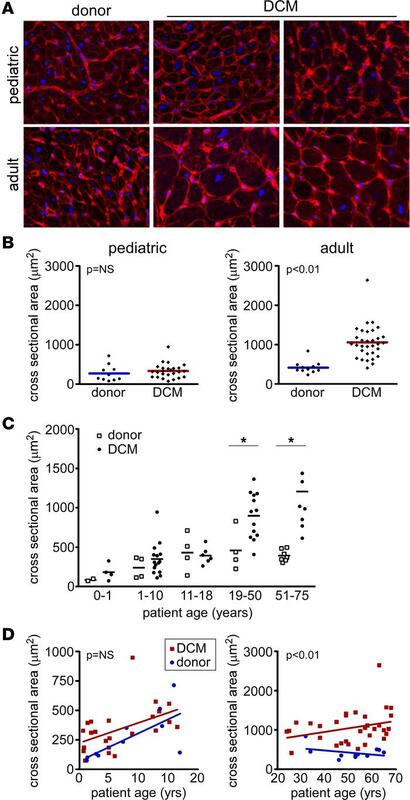 In contrast, adult DCM patients display increased cardiomyocyte cross-sectional area compared with donor controls. Blue, DAPI (nuclei). Magnification 400×. (B) Quantification of cardiomyocyte cross-sectional area. (C) Cardiomyocyte cross-sectional area stratified by age, revealing that cardiomyocyte cross-sectional area does not differ from donor controls across pediatric groups. *P < 0.05 (Mann Whitney U test). (D) Scatter plots showing that cardiomyocyte cross-sectional area does not differ as a function of age in pediatric DCM patients. In contrast, adult DCM patients have increased cardiomyocyte cross-sectional area at all ages examined.